What is Artificial Photosynthesis and Why is it important ? Photosynthesis is the chemical reaction that takes place inside green plants in the presence of chlorophyll and sunlight. Caron dioxide and water are converted into plant food and oxygen with the help of chlorophyll and sunlight. 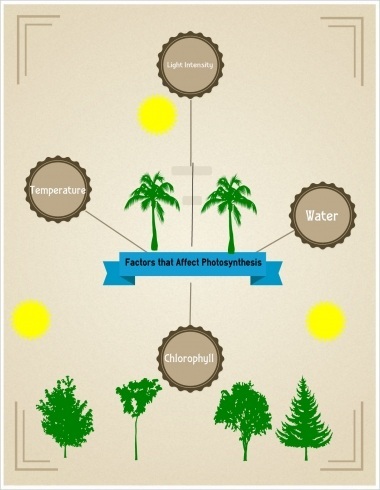 Besides these two factors, there are other factors such as carbon dioxide, pH levels, light intensity, and temperature that affect photosynthesis. The intensity of light affects the rate of photosynthesis. A low light intensity would mean low rate of photosynthesis. Increased intensity of light leads to a high rate of photosynthesis. Once the intensity has reached 10,000 lux, it does not affect the photosynthesis rate. A very high intensity of light can bring down the photosynthesis rate as it can bleach chlorophyll. Very high or low temperatures are not suitable for the photosynthesis process. Enzyme activity is essential for the two stages of photosynthesis. Temperatures ranging near 0 degrees C deactivate the enzymes affecting photosynthesis. Similarly, very high temperatures denature the essential enzymes prohibiting photosynthesis. The ideal temperature range is 25 to 35 C.
Chlorophyll absorbs light, without which photosynthesis cannot take place. An absence of chlorophyll will mean that photosynthesis will not take place at all. Certain diseases, mineral deficiency, and aging may lead to chlorophyll deficiency. Water is the life source for plants; plants cannot survive without it. Lack of water leads to lack of carbon dioxide as the leaves refuse to open their stomata to keep water they have stored logged inside. A polluted atmosphere can lead to a 15 percent decrease in the rate of photosynthesis. Industrial gases are the major culprit. Soot, which settles down on leaves, blocks the stomata, making it difficult to take in carbon dioxide. Polluted water affects aquatic plants and their photosynthesis process. For photosynthesis to occur at a constant rate the presence and levels of various factors are essential. Photosynthesis needs all of them at optimum levels to produce the best results.